On a spacious corporate campus in rural Wisconsin, visitors will find their favorite fairytales come to life. 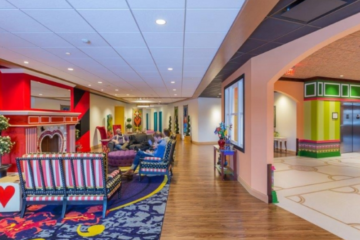 The company is passionate about building environments with strong thematic concepts that reflect the energy and creativity of the young workforce, while maintaining a level of professionalism that is important to visiting customers. 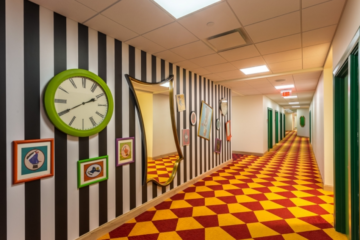 This led to themed spaces ranging from The Wizard of Oz to The Brother’s Grimm to Wizards Academy. The latest creation, Alice, follows the famous story of Alice’s Adventures in Wonderland and the titular character’s anthropomorphic friends. The result is a fantastical space that’s anything but ordinary. 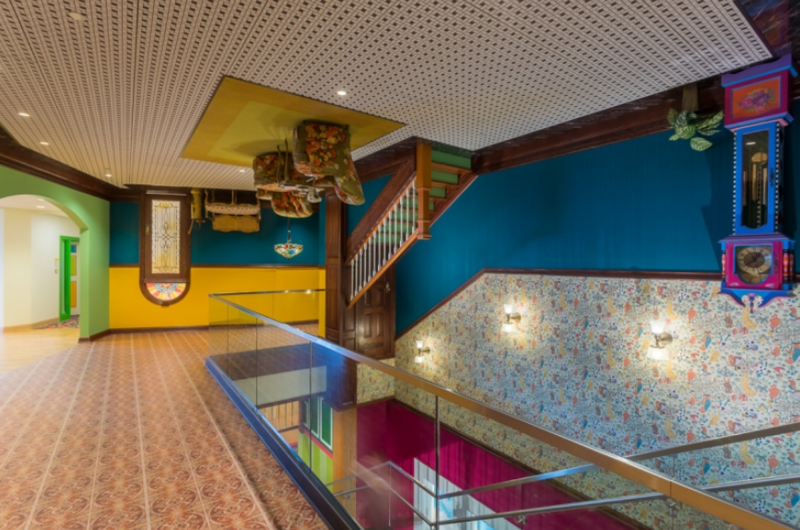 The interior design of Alice takes the visitor down the rabbit hole of absurdity that is Alice in Wonderland, with each wing of the building being as incongruent and colorful as the original story written over 150 years ago. 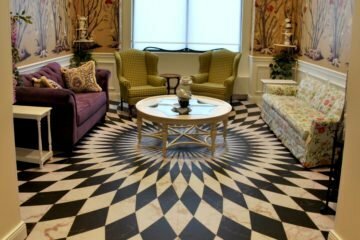 To achieve an appropriate balance of creativity and professionalism, INSTALL Warranty Contractor Mr. David’s Flooring worked with architect and designer IN-teriors to flood the otherwise undistinguished hallways in colorful carpet, LVT and other resilient flooring. 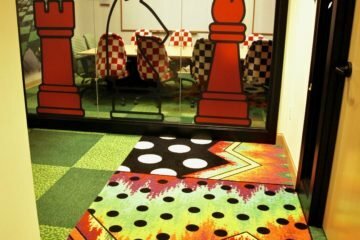 This was offset by white walls and accented by brightly colored door frames, along with themed décor, furniture and other finishes. 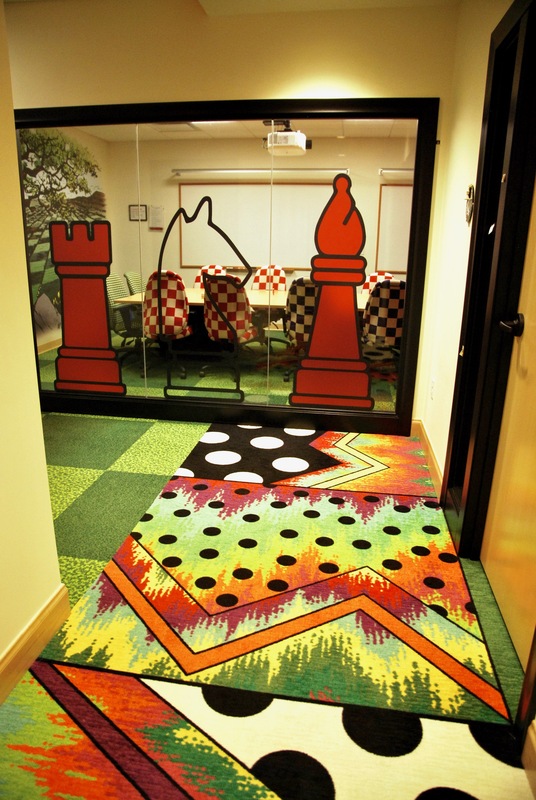 Direct literary references are found in the carpet, helping to define “neighborhoods” in the building. 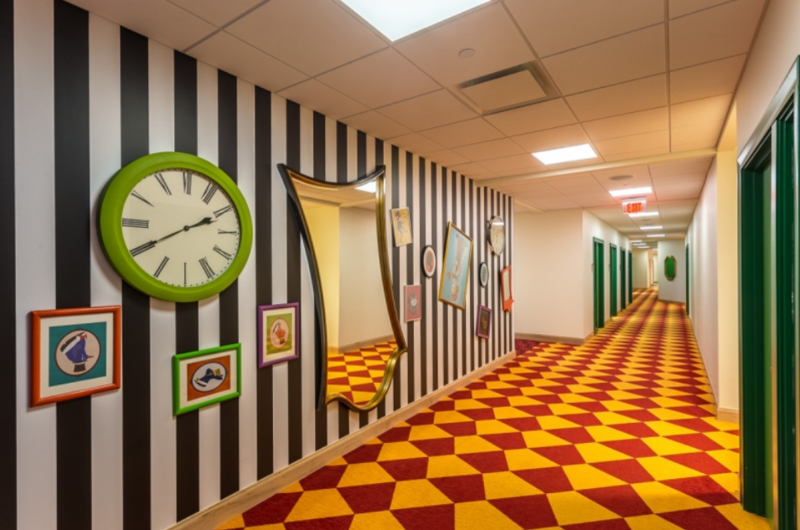 Visitors can find their way to the Mad Hatter’s Conference Room by following the teapots and teacups. Pocket watches get employees scurrying on their way to find the White Rabbit’s House Conference Room. These destinations become notes of interest that offer additional opportunities for theming to reinforce the neighborhood concept while providing landmarks for giving directions and finding amenities. The focal point of the building is the central feature stair lobby, where an architecturally accurate Victorian interior has been installed upside down. 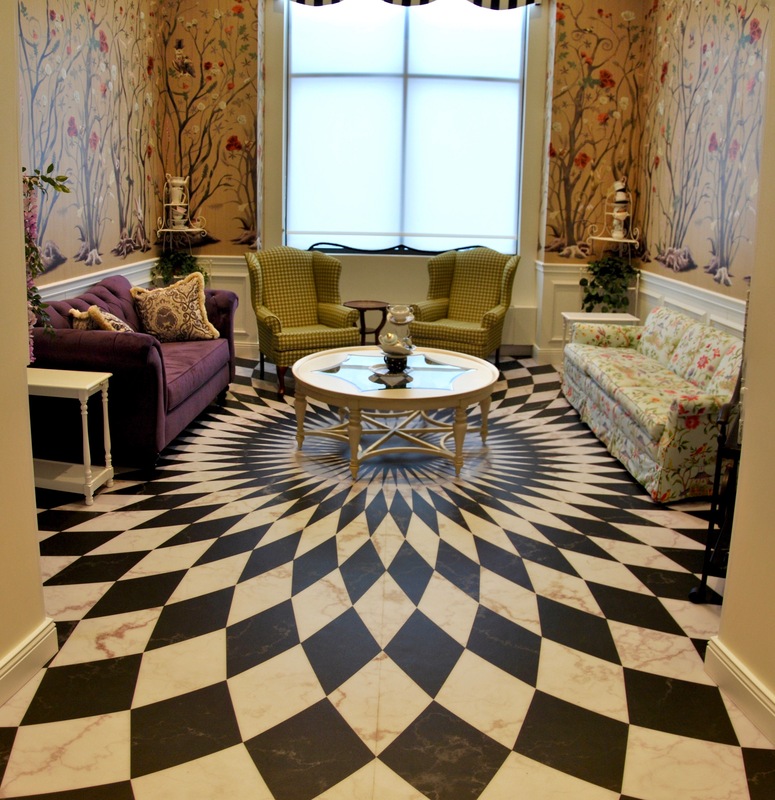 Resilient flooring was printed to look like period specific ceiling treatments. In addition the team added vintage furniture hanging from the ceiling. By embracing the disjointed concepts, each wing of the building has a distinct personality. 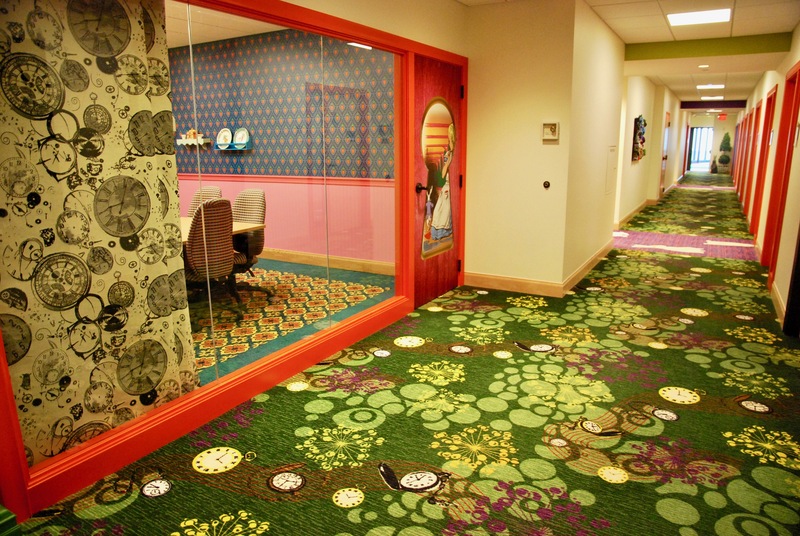 Despite focused theming, the building remains a traditional corporate layout covering over 100,000 square feet. Long white halls punctuated with private offices offer little architectural variation, making it easy to get turned around without distinguishing landmarks to guide the way. 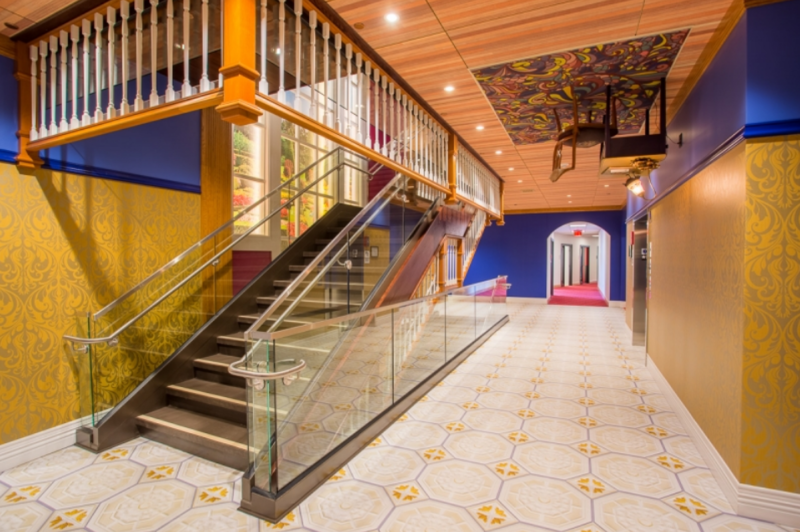 Using a limited material palette and focused theming elements allowed the design team to create a unique and vibrant visitor experience that serves as wayfinding, breaks up long sight-lines and provides a backdrop for the client’s art collection. While the design layout was a challenge, the installation team from Mr. David’s had a more serious problem with the subfloors. They found much higher than tolerant RH levels in the concrete, but needed to stay on time and keep within as much of the budget as possible. Therefore, the highly trained experts at Mr. David’s decided to forgo expensive epoxies, opting instead for a more economical solution that would save the client time and money while addressing the high RH levels. The installation team used an upgraded adhesive which would allow them to install much of the flooring directly on top of the concrete. Rolled on with a red and white candy-striped roller, the adhesive is a break-through, user friendly product that can be used for vinyl tile, vinyl plank and solid vinyl sheet goods. It resists flooring indentations and disbonding from displacement under heavy rolling loads, and provides a smooth, clean installation process that helps to reduce the effect of moisture. Alice also featured a significantly shorter timeline than initially specified. The installation team was originally given three and a half months to complete the project. However, due to moisture challenges and other trades on site, they ended up completing the entire job in just six weeks. The team from Mr. David’s was unfazed, and had 6-8 installers on the job daily to meet the demands. While this included overtime labor, the contractor was more than willing to accommodate the condensed timeline and put its INSTALL training and certification to good use. By embracing the multiple design concepts, each wing of the building has a distinct personality. In true Wonderland fashion, you may not know where you’re going, but you know where you’ve been. 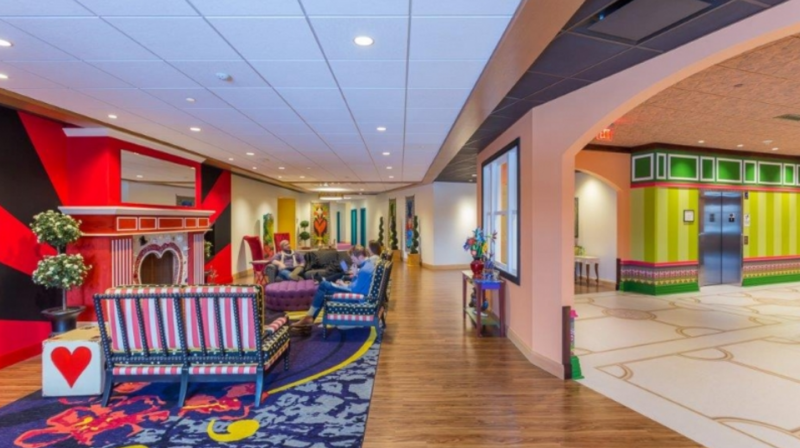 Any visitor will be sure to find a delight around every corner, and each and every employee has a unique, vibrant and experiential place to call home. In addition to a happy client and employees, a special honor was bestowed to the project at the 2017 Starnet Design Awards. In direct response to the incredible creativity and execution displayed, the Excellence in Imagination Award was given to Mr. David’s Flooring. 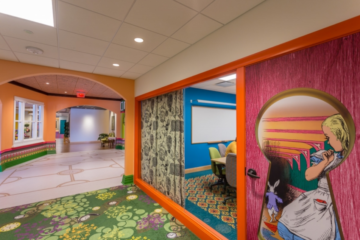 With Alice open for business, the company looks forward to continuing growing its themed campus. Who knows what story will come to life next?